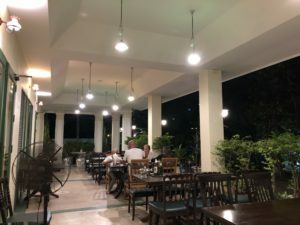 I have been to a couple of the 7 Somboon Seafood branches in Bangkok, but I wasn’t aware of Somboon Pochana in Sukhumvit Soi 20, with a very similar menu to the more famous chain. I got suspicious as the Somboon name is known to be used by fake restos in Bangkok in order to take advantage of the name. Somboon Seafood branches normally have indoor seating and high prices, while this one couldn’t be more of a street food cart than it already was, only a few tables and plastic chairs next to the traffic. I decided to have a sit down, and I have never regretted it since. 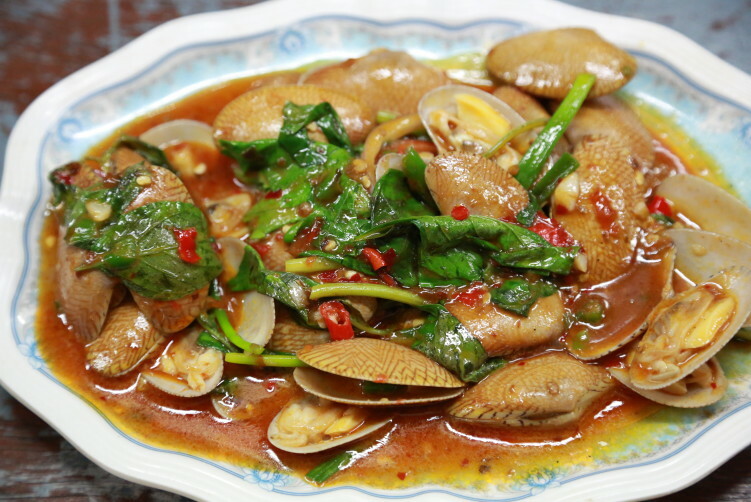 Somboon Seafood branches are located all around Thailand and are known for their quality seafood. Some of their well know dishes includes garlic shrimps and steamed grouper, in addition to squid and oysters. But their prime dish is considered to be the yellow curry-powder crab, the best in town many says. I don’t agree with that, but yes, they are good at it. 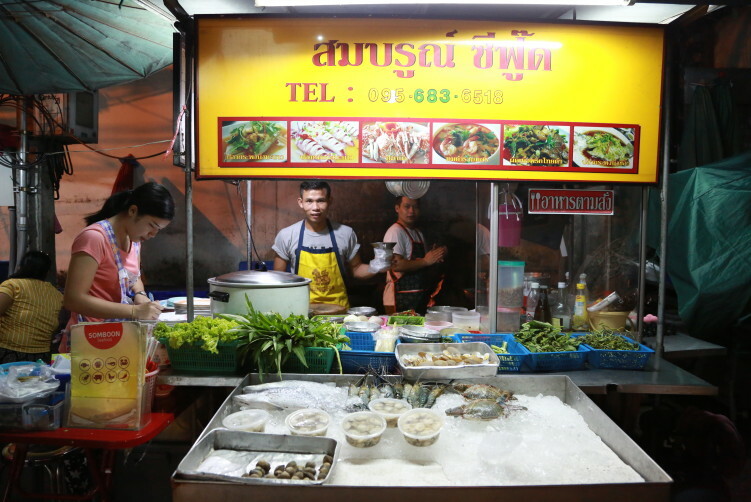 Let me immediately admit that I found the food from this humble street cart in Soi 20 so good that I immediately sent an email to Somboon to ask if this was someone trying to take advantage of their name or if it was a real branch. I never received an answer, but I am pretty sure that the Somboon Pochana street stall in Sukhumvit Soi 20 doesn’t belong to the more famous chain. And formally, the name Somboon Pochana (pochana=restaurant) is different from Somboon Seafood. It can be many reasons behind a name and it doesn’t have to be the purpose of using others well earned credibility. And this street stall in Soi 20 doesn’t need to take advantage of anybodies name, as it was no doubt they could could create their own name, whatever it would be, among locals. And yes, all tables and chairs was occupied when I arrived, giving me a 5 minute to take in on the atmosphere. Most guest seemed to be ecstatic. It could of course be something in the bottles, but my suspicion was the food. One of my favorite Thai dishes is Hog lie Pad Prik Pao, which basically means clams with fried chilies. But don’t worry, it’s really not that spicy. Few westerns would have problem with it. It actually have a slightly sweet hint to it, not uncommon as many Thai’s have a rather sweet tongue. The dish comes in different sizes and the one on the pictures is B100 (small). Not enough on it’s own, but a perfect plate in combination with another dish. Three dishes seems to be good for two here. The clams were definitively the star of the meal, amazingly good. The clams was ultra fresh and the sauce was to die for. I wouldn’t hesitate to give the cook standing ovations for the performance, even considering that it is a rather uncomplicated dish to prepare. It includes oil, minced garlic cloves, roasted chili paste (nam prik pao), sugar, fish sauce, chilies (not to spicy like Chee Fah chilies), holy basil and the clams. And of course there might be some individual secrets. Of course I came back two days later. 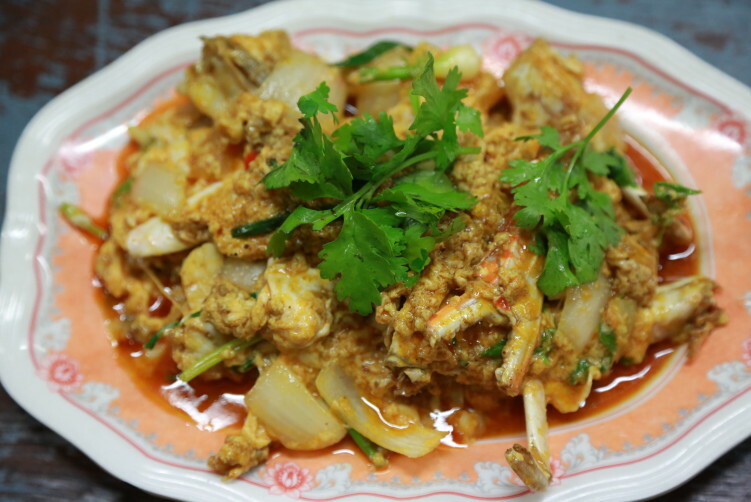 But don’t let me forget what is considered the most renown dish at the more famous chain with the same name; Crab in yellow curry powder (poo pad phong ka ree). I ordered a small portion at 250 Bath, but it actually was a rather big portion. Crabs are pricier than most dishes no matter where you are in the world, and Bangkok isn’t an exception. But again, I was overwhelmed. It might not be better than what is served at the more famous chain, but it didn’t stood back for it either. It was a really good dish, and for a much lower price. My third dish, which I soon understood was too much quantity wise, was squid with lemongrass. It was the disappointment of the day, not because it tasted bad. It tasted good and the squid was delicious, but the lemongrass was not thouroghly chopped and a bit too hard. It could of course be a deliberate texture, but I like my lemongrass a bit more soft and juicy. It lifted another B100 from my wallet. Some people say it’s not difficult to understand why people call ahed to get a table at the Somboon Seafood chain. 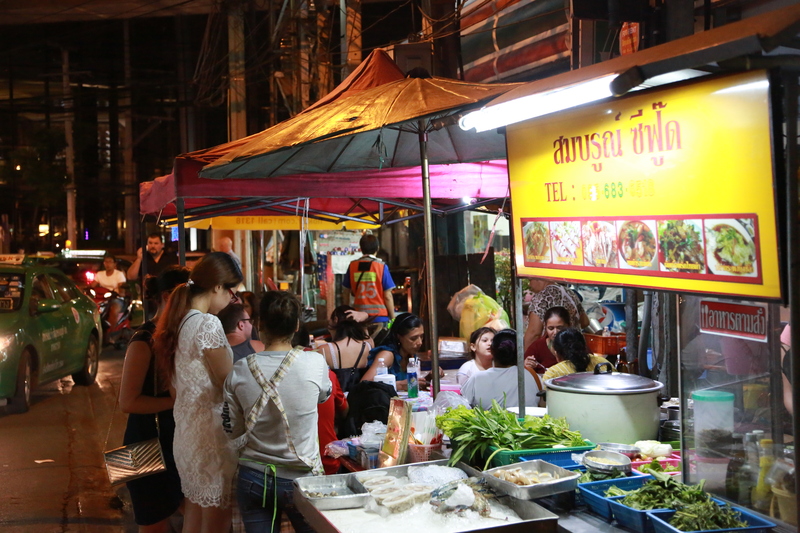 Personally I choose the street side of Sukhumvit Soi 20 and have a delicious meal for the fraction of the price. Street side dining isn’t that comfortable in many aspects, but it certainly has atmosphere. buy generic viagra Price: From 60 Bath up to a couple of hundreds. Crabs are pricy all over the world. How to get there: BTS to Asok, then walk to Soi 20. You find the store 10 meters into the Soi on the left side of the road, next to 7/11.